Love herbal tea is an invigorating blend of natural herbs that help ‘the love grow stronger’ and ‘eros’ bear fruit! These individually handpicked herbs are especially beneficial to the reproductive system. 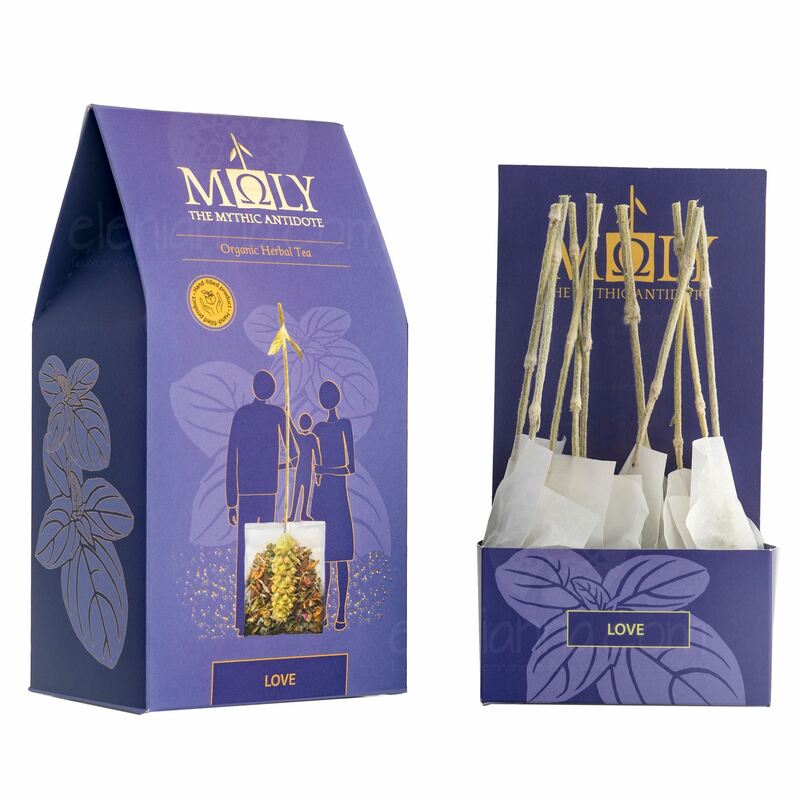 Moly Love helps balance the reproductive hormones, both male and female, while relieving them from possible stress, with herbs that reinforce the peripheral vascular system, especially in the reproductive organs. Mt. Olympus ironwort, Ashwagandha, Maca, Spearmint, Nettle, White mulberry. Defence herbal tea is a blend of herbs, high in antioxidants, that reinforces the body’s defenses. Detox herbal tea is a revitalizing blend of natural herbs that is naturally detoxifying and cleanses the body. Digestion herbal tea consists of herbs that are traditionally known to be beneficial to the digestive system. Ideal before and after meals. Energy herbal tea is an invigorating blend of natural herbs that boosts both mental and physical energy. Harmony herbal tea is a blend of natural, aromatic herbs that reduces stress and anxiety and promotes relaxation and calmness. Night cup herbal tea is a blend of natural herbs that promotes relaxation and helps you have a deep and restful sleep. Silhouette herbal tea is a blend of natural herbs that helps maintain a healthy silhouette and keep you in shape.